With 2018 rapidly drawing to a close, CBAR is planning its crime prevention strategies for the festive season. No operational staff take leave during this period, ensuring full compliments in each shift with additional resources being added during this peak time. CBAR has also taken delivery of 3 new vehicles, which too will be commissioned within the following week, and still proudly boasts the biggest fleet of Armed Reaction vehicles in the city bowl area. Being our 20th operational festive season, we at CBAR are aware of the crime patterns associated with this time of the year. Previous years hot spots and crime trends have been discussed and we have now planned our most pro-active security details ever. We are acutely aware of the increase in criminal activity, not only in our area, but nationally. Together with local SAPS, law enforcement agencies and other security service providers we will endeavour to create a safer neighbourhood for all. Please consider that for this time of year it is normal behaviour that people become more relaxed and sometimes a little careless. Ensure your alarm system is fully functional and that it has been serviced within the last 12 months. Test your alarm to confirm a signal is received by our Monitoring Centre. Ensure all zones are working and that outside foliage is trimmed sufficiently to prevent interference with outdoor sensors. Don’t leave this until the last minute; rather check your system timeously before leaving on holiday. Ensure all lighting is working and connect outside lighting to a timer system, as well as random internal lighting so that your property appears occupied at night. Leaving outside lights on during the day is an indicator of an unoccupied home. Inform neighbours and friends of your intentions to leave your home unoccupied and that they are to report all suspicious activity to your security service provider. Inform CBAR in writing of the dates you intend to be away as well as at least 2 contact numbers of responsible persons (key-holders) who can be contacted in the event of any issues which may arise at the property in your absence. Please send all holiday instructions to customerservice@cbar.co.za. Try not to advertise too much information on social media regarding your movements should you intend to go on holiday. Always double check everything that can be locked up or closed at your residence, is actually locked, as a window left slightly open may trigger the alarm continuously or provide an access point to a criminal. Do a full walk around of the perimeter. Similarly, don’t treat a rented property or holiday home with any less responsibility than your primary residence. Criminals notice holiday homes with vehicles that have out-of-town number plates and again tend to target these as opposed to local residents. Ensure that staff who remain on the property whilst you are on holiday are able to use the alarm system effectively and specifically the panic buttons. Any house guests using your home in your absence should know how to use your electronic alarm system as well as have the “password” in the event that the alarm is triggered accidentally. If travelling locally, ensure your vehicle is ready for a long trip, so as to avoid breaking down in an unfamiliar area or at night. Try not to move around with too much cash or valuables, and be extra vigilant when you are at your holiday destinations. Criminals in other areas often target vehicles with out of town number plates, knowing visitors leave valuable items in vehicles whilst on holiday. Whilst driving, be over-vigilant. Many opportunistic criminals may try a smash and grab at a robot or in congested traffic. Ensure you maintain your peripheral vision to avoid surprises. No bags, handbags or cell phones should be within reach of an open car window. Always plan your route well in advance and have a list of emergency numbers just in case. Heavily congested areas such as malls, beachfronts and tourist attractions also attract criminal elements. With just over 9000 registered security companies in South Africa offering various security related services or goods, it may be cause for concern for clients or potential clients wishing to make an informed choice on a reputable service provider. Some companies may see the increase in crime as a business opportunity to charge very over inflated rates, which usually have a specific target market within affluent areas. Other companies try break into a market by under cutting prices. There are certain basic criteria that should be met before considering contracting a security service provider. The following is in response to enquiries from existing clients and non-clients. Is the company SAIDSA compliant and registered. SAIDSA (South African Intruder Detection Services Association) has all companies listed on the SAIDSA Approved Register which means that, the particular company complies with stringent standards laid down by SAIDSA in all disciplines including Armed Reaction, Alarm Monitoring and Installation. This particular register of Approved Service Providers has not only been compiled to ensure that a company chosen is a reputable company with the correct business ethics, but has also been endorsed by SAPS, the South African Security Federation and the Insurance Surveyors Association. Only companies registered with SAIDSA and found on the register will be afforded discounts by certain insurance companies. SAIDSA and PSIRA (Private Security Regulatory Authority) are not to be confused as all security officers and companies, as a bare minimum should be PSIRA registered. Linking an alarm to a non SAIDSA approved and inspected monitoring centre as well as contracting companies who offer Armed Reaction, but are not in actual fact SAIDSA registered, exposes yourself to the risk of not being paid out by an insurance company after a break-in. The SAIDSA logo will be displayed on all vehicles, stationery, signage etc. as this is a requirement, making an approved company easily recognisable by the circular chain logo with SAIDSA wording in the centre. Technical work carried out on alarm systems should at all times be conducted by trained SAIDSA certified technicians, as there again are a number of alarm installers who are not fully qualified to work on electronic intruder detection systems. The Monitoring Centre is solely reliant on getting the correct signals to affect a proper dispatch of Armed Reaction Staff. Alarms should be serviced at least once annually and tested every 2 – 4 weeks as a guideline. Be completely satisfied that you have vetted and checked any service provider that is offering a security service of any sort to be SAIDSA approved, as you may have little or no recourse if you have a service related issue. SAIDSA at their 50th anniversary celebration. “A show of force” – a common sales tactic to entice new business whereby the company selling a particular security service will arrive, with a “small army” to impress potential new clients. This often involves drawing on most of the company’s resources from various areas to present a collective to window dress for potential new clients. Making unrealistic and unsubstantiated claims as to achievements so far as to over-inflate the company’s success and often down play other successful role players involved in crime fighting / law enforcement. Have a budget and know what you can pay for a service on a sustainable level moving forward is important. Any service that becomes financially unsustainable for the client will result in the service being cancelled. What is the security company’s main focus and who are the company’s owners and / or directors and what are their track records? Make sure all contracts are scrutinised and contain specifics such as contract duration; annual escalation, exact nature of service to be provided and that they contain the required clauses from the consumer protection act, especially the cancellation clauses. If a service provider doesn’t render an effective service, as a client you should be able to cancel and not be held to ransom by a contract. Does the Security Service Provider leave the area during shift change to collect new members and if so, how is the area of responsibility covered during this period. Speak to your neighbours or anyone else using the service provider. Never rush into an agreement with the first security service provider that may offer a solution. Consider various companies and look at all the options. Reliability is also key. Criminals will take note that properties are protected by a professional security service provider and if a company is based in its area of operation, it is a given that the company’s response vehicles will always be in the vicinity. Company’s sending vehicles into an area to provide a service may experience logistical issues, experience high traffic congestion or staff shortages etc. Local companies will also be well networked with local authorities and known key individuals within SAPS and law enforcement agencies. Professionalism and integrity. Security service providers should have strict criteria when it comes to hiring staff and offer excellent customer service, as prioritizing customer concerns are the indicators of a reliable company. We hope this helps in some way to answer a few of the questions posed to CBAR, on how best to choose a security service provider. For all security / medical or general assistance. 24 hours a day, only minutes away. 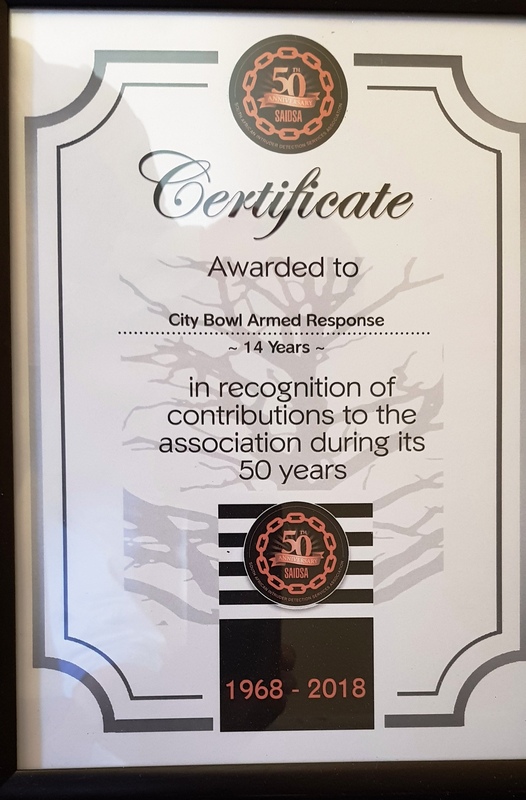 We at CBAR would like to thank you for your continued loyalty and trust in providing you with an honest and reliable security service. We wish you, your families and loved ones a wonderful and safe festive season and may 2019 be the beginning of a safe and prosperous year for all.